We’d love your help. 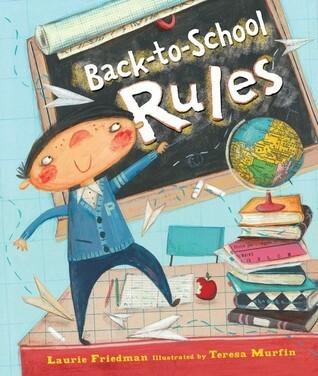 Let us know what’s wrong with this preview of Back-To-School Rules by Laurie B. Friedman. School's in session! When it comes to surviving school, Percy's at the head of the class. If you can follow his ten simple rules, making the grade will be a piece of cake (and school will be a lot of fun). But there's more to school than showing up on time and staying awake in class. If you have any doubts, Percy also shows exactly what not to do. - No runn School's in session! When it comes to surviving school, Percy's at the head of the class. If you can follow his ten simple rules, making the grade will be a piece of cake (and school will be a lot of fun). But there's more to school than showing up on time and staying awake in class. If you have any doubts, Percy also shows exactly what not to do. - No running in the halls! - No bouncing off the ceiling! To ask other readers questions about Back-To-School Rules, please sign up. Percy might be a fun loving guy, but his back-to-school rules are a major downer for a first day at school. I liked the idea of this book, but the rules were all about 'do not' do this and 'do not' do that. I love the quirky illustrations -- it looks like a fun school day! But the text, oh the text. Page after page of no, no and no. The rules are negative - don't do this, don't do that. Instead of being endearing or silly, it feels heavy and sad. Not the feeling I want to share with students at the start of school! While I understand the logic behind this book (telling kids what isn't appropriate so they're well prepared for the first day of school), I didn't care for the constant "No"s and "Don't"s. And really, could they have chosen a worse name for their protagonist, whose initials boil down to "P.I.G."...? I liked the whimsical illustrations and humor in this book about school rules, but it bugged me that the rules were a list of don'ts. Most teachers I know prefer to present classroom rules in more positive ways. I don't like that Percy Isaac Gifford's rules all contain "DO NOT." I always avoid negative rules. "Don't be late" can be changed to "Arrive on time." DON"T read this book on the first day of school. This book is just a list of "don'ts" How about what you can do? If I were to read this to kids on the first day of school, I would be shocked if they came back the next day. For example the first rule is "Do NOT show up late, you will be marked tardy, teachers do not like to wait." Another is "Don't contradict your teacher, you will not win her vote." All the rules seem to be about staying quiet, still and being perfect in order to please the teach DON"T read this book on the first day of school. This book is just a list of "don'ts" How about what you can do? If I were to read this to kids on the first day of school, I would be shocked if they came back the next day. For example the first rule is "Do NOT show up late, you will be marked tardy, teachers do not like to wait." Another is "Don't contradict your teacher, you will not win her vote." This book is such a Debbie Downer. And by "back-to-school rules," it means pages and pages and pages of rules. Constant nagging of "don't do this" and "don't do that." Way to go, authors! You know how to excite the kids about going into a classroom! My personal favorite, towards the end of the book, stated: "I think that covers everything. Now you know what NOT to do. Just follow my simple rules, And an A+ waits for you." Thank you, No Child Left Behind! Now I know my A+ is not This book is such a Debbie Downer. My personal favorite, towards the end of the book, stated: "I think that covers everything. Now you know what NOT to do. Just follow my simple rules, And an A+ waits for you." Thank you, No Child Left Behind! Now I know my A+ is not based upon my knowledge but based on how well I follow the rules so I don't tick off the teacher. Just do what you're told. Now I understand what school is all about. Summary: "Back-To-School Rules" is a book about a little boy named Percy Isaac Gifford. When it is time to go back to school, Percy has a list of rules for what not to do in school. Evaluation: I rated this book a 3. Even though this book is a funny way to introduce rules and procedures in a classroom, I did not care for the "no's" and "don'ts" that were throughout the book. Teaching Idea: This book could be used in school to teach classroom rules and procedures. Fun premise, but poor meter and forced rhyming. Would have been stronger if written in prose. I read this book with my 4 year old grandson. He is autistic so he has been attending school for about 2 years. As returning to school is coming up I thought this would be an awesome pick to get ready. I was not disappointed. We loved the book. Percy is off to school and has some rules to share. There are 10 simple rules of what Not to do. Yes they are told from a negative point which may put some people off. I myself prefer to give positive rules of behavior. Not everyone does though. So we all I read this book with my 4 year old grandson. He is autistic so he has been attending school for about 2 years. As returning to school is coming up I thought this would be an awesome pick to get ready. I was not disappointed. We loved the book. Percy is off to school and has some rules to share. There are 10 simple rules of what Not to do. Yes they are told from a negative point which may put some people off. I myself prefer to give positive rules of behavior. Not everyone does though. So we all have to deal with both types of rules in daily life. The text was told in rhyme and the rules, though negative, were fun. The illustrations were delightful. My 4 year old understood every one of them. He was not put off by the No's and Don'ts. They were all rules he knew and he was comfortable with them. Rules were presented in a fun way and were understood; which is exactly what I think the author set out to do. Percy Isaac Gifford is ready to tell us his rules for going back-to-school. Only his rules tell us what NOT to do in school. Percy gives the reader his ten simple rules for going back to school and assures us that if these rules are followed, the act of going back-to-school will be a success. Friedman’s delightful book gives children a fun heads-up as to what NOT to do when they are in school. Paired with Murfin’s colorful illustrations, Friedman’s rhythmic prose tells every child the best way to Percy Isaac Gifford is ready to tell us his rules for going back-to-school. Only his rules tell us what NOT to do in school. Percy gives the reader his ten simple rules for going back to school and assures us that if these rules are followed, the act of going back-to-school will be a success. Friedman’s delightful book gives children a fun heads-up as to what NOT to do when they are in school. Paired with Murfin’s colorful illustrations, Friedman’s rhythmic prose tells every child the best way to survive middle school. The rules are fun and interesting, while actually accurately depicting rules that teacher’s would appreciate students following, such as “Don’t sing too loud or stare” or my favorite rule, “Don’t slither on the floor!” A great must-read for those children entering school and feeling a little bit nervous, this book will definitely lighten the mood! Fun illustrations, many rules throughout the books for kids to follow when going to school for the first time or for those returning to school and may need a gentle reminder of what is appropriate behavior at school. This book is appropriate to read out loud to grade school classes, maybe grades K-2nd or possibly 3rd as they might enjoy some of the illustrations and connect to the rules of what is appropriate and what isn't. Percy Isaac Gifford is off to school and provides rules of etiquette so that readers will know exactly what to do. In rhyming text, he gives helpful hints about how to act and how not to act such as "No hanging from the ceiling." Teachers might want to share this title with their students on the first day of school as a gentle, amusing reminder of behavioral expectations. It's possible to have fun while also behaving properly, the last page reminds us. I loved the expressions on the teacher in t Percy Isaac Gifford is off to school and provides rules of etiquette so that readers will know exactly what to do. In rhyming text, he gives helpful hints about how to act and how not to act such as "No hanging from the ceiling." Teachers might want to share this title with their students on the first day of school as a gentle, amusing reminder of behavioral expectations. It's possible to have fun while also behaving properly, the last page reminds us. I loved the expressions on the teacher in the various illustrations which are sometimes rendered in panels and sometimes cover the entire page. "Back to School Rules" is a how to told from the point of view of Percy Issac Gifford. He's an A+ student and in this how to he's giving you all his best rules and tips to help you be an A+ student too! I thought this book was super cute. It probably should not be the very first book you read to your students, seeing how it's a whole long list of don't do this, no doing this, don't, no, ... But this could be a great book to start some discussion about class rules and how to behave, and the end i "Back to School Rules" is a how to told from the point of view of Percy Issac Gifford. He's an A+ student and in this how to he's giving you all his best rules and tips to help you be an A+ student too! It time to go back to school and the most important thing to know it not what to do. This book goes into all the rule of school and what you shouldn't do. Funny way to put boring rules. I would use this book on the first day of school to help with going over the rules in a more exciting way. Friedman, L. B., & Murfin, T. (2011). Back-to-school rules. Minneapolis: Carolrhoda Books. Reading this book made me so happy, because it includes all the rules the teacher would want to implement in the classroom. The perfect book to read when students are creating classroom rules. The illustrations are funny and the style of the book makes reading it just as fun! The rules are explained so that there is no confusion. Perfect for all ages! Colorful and lively, artwork compliments text which is reminiscent of K. Applegate's Roscoe Riley series. Younger readers may need to be debriefed with a dictionary (fret, contradict), but a welcome title for back to school and exploring rules. This book was so cute. It had some really good, pertinent rules for school. As well as the obligatory silly rules that kids will think are funny. Wearing his monogrammed school cardigan, young Percy Isaac Gifford explains his rules of success for getting the most out of the school year. Good book for beginning of the school year. Another entertaining read aloud for back to school. Stay Away! Exactly what I DON'T want to read to students. Lists and lists about what NOT to do at school. Ugh! This book really rubbed me the wrong way. Full of stereotypes and rules that tell you what NOT to do at school. Ugh. Grade k-5. We work hard to focus on the positives at school. All I read were dont's. Some of the meter was forces in the rhymes. Illustrations were cute, but don't save the book. Laurie Friedman is the author of over 50 award-winning picture books, chapter books, and novels for young readers including the bestselling Mallory McDonald chapter book series, The Mostly Miserable Life of April Sinclair teen journal-format series, and many rhyming picture books, including the Ruby Valentine series.